/ Comments Off on Beyond the blog. Gawker founder Nick Denton is one of the most aggressive and successful blog publishers around. He started with a good gut understanding of what works online, and built a federation of blogs that exploit a similar model (low overhead, smart and fast writers, efficient tech and ad sales) to great effect. Gizmodo, Gawker, IO9, Lifehacker are all category-leading blogs, or close to it; some of them (like Gizmodo) are starting to compete with traditional media as well. But what is more significant, his operation is devoted to objective, metric analysis in a way that no one else is. 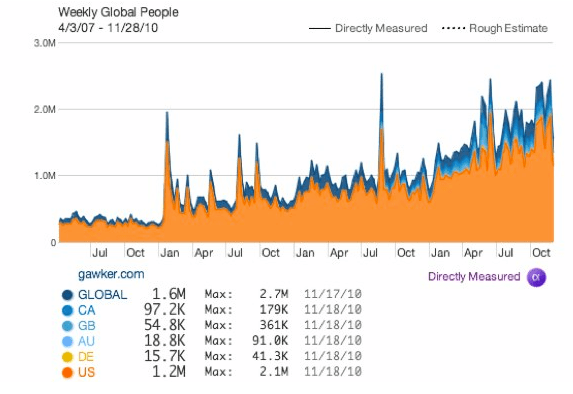 Gawker’s metrics are public — and the metrics for every writer are public too. It’s at the core of the organization. And carefully watching the data, I think, has shaped his strategy more than anything. It’s also led him to be way ahead of the curve in many cases (I’m thinking of the way he started planning for a 40% decline in ad spending, in 2008, long before the rest of the media were willing to face up to what was coming). It’s somewhat amazing, then, that he’s willing to share the results of his insights. Lifehacker today hosted his thoughts on where Gawker Media is going in 2011. Now, this could be a classic head-fake, and perhaps Denton is only publishing this plan to throw the rest of us off. But I don’t think so. I think the advice in here is solid, and he’s publishing it because the odds of his slow-moving competitors actually being able to capitalize on this information are slim to none. Meanwhile, Denton raises his cred among smaller publishers, editors and writers, some of whom may be eager to work for him at some point. Be that as it may, there are some good pointers in Denton’s roadmap. 2. Aggregation is important for filling in the gaps between a few breakout stories each day. The solution? First, two types of edit staff: editors/curators, and reporters/producers/scoopmongers. Second, relegate the reverse-chron “blog flow” to a sidebar, and make the stories, not the blog, the center of attention. 3. Having a variety of content is important — even more so as your audience grows and becomes more diverse. 4. Photos, videos, and strong visual presentations work really well now. 5. You can sell video ads in banner ad spaces. 6. Gawker is being programmed more like a TV network, with time slots for stories and ad campaigns, and less like a newspaper or magazine. 7. Gawker is going after brand advertising, the traditional stronghold of magazine companies like Hearst and Conde Nast — and the TV networks. To do that, they’re going to be moving upmarket this year. Sponsorships and time-slot campaigns are the key to moving out of the doldrums of low-value, high-inventory web advertising. Big media, watch out. Denton’s done with blogging; his next target is finding an even more profitable form of new media that blends aspects of blogging, magazine journalism, and TV.